Last night I enjoyed one of the best meals I've had in quite some time. 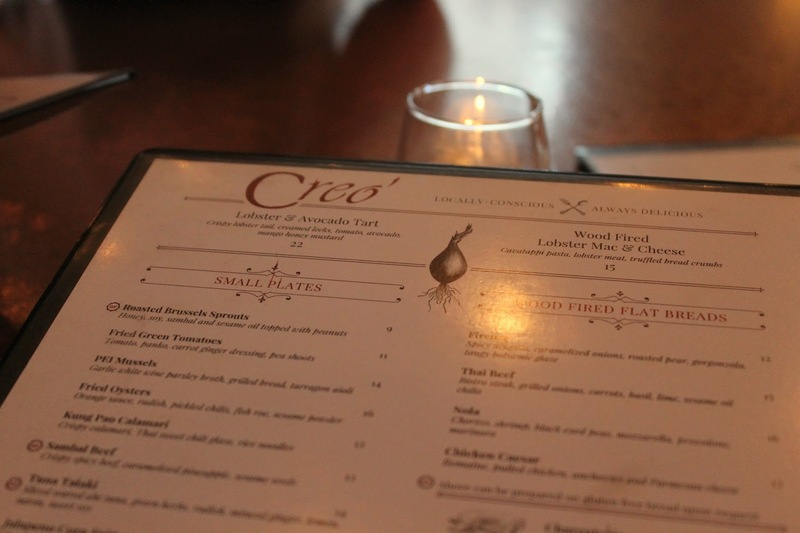 The folks at Creo' in Stuyvesant Plaza invited me to enjoy their new summer menu which also introduced new Executive Chef, Eric Sell. Chef Sell adds a strong Asian flare and some Italian influence to his dishes as he lived in Hong Kong for 11 years and Italy for one. 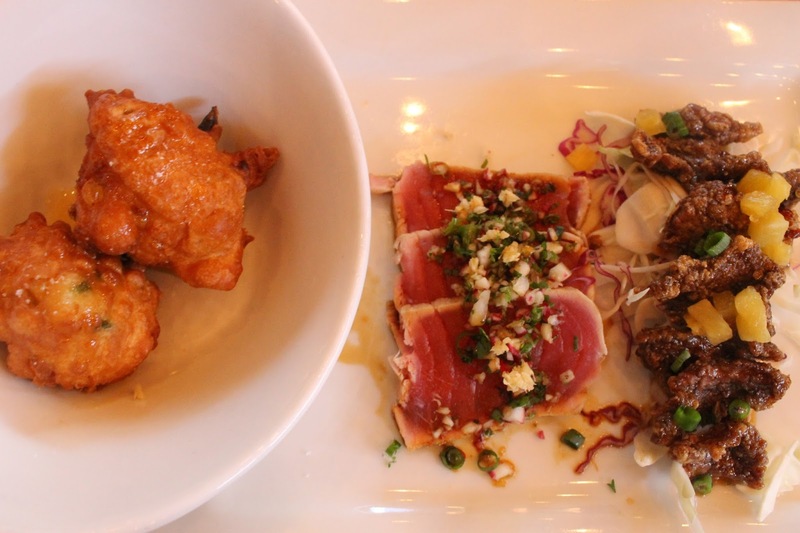 For the launch event we were able to choose three appetizers and two entree items, all plated in smaller portions to ensure we tried as many menu items as possible. 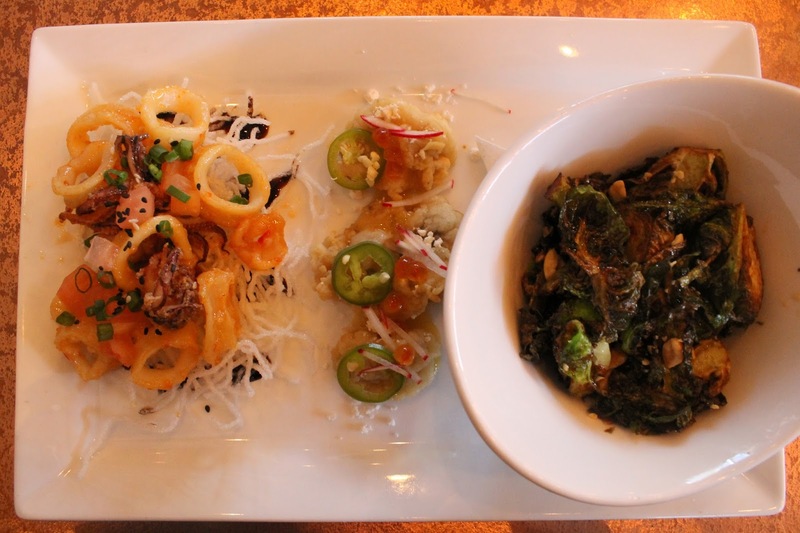 We pulled up our sleeves and went to town on the appetizers, ordering all but two. 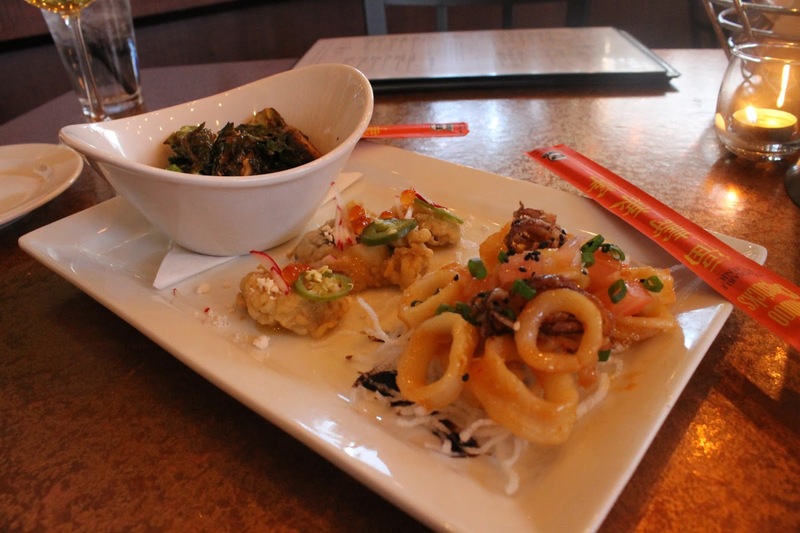 For the first plate of appetizers we ordered the Kung Pao Calamari with Thai sweet chili glaze. 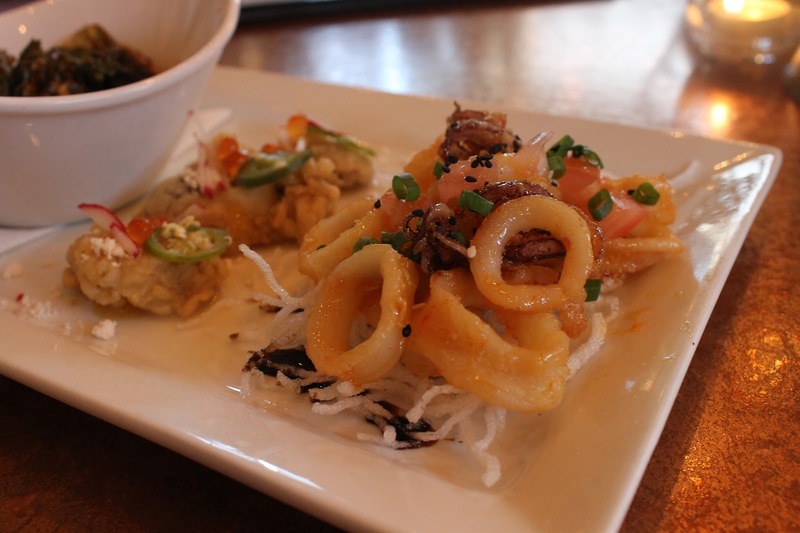 The calamari isn't a new addition to the menu, but I still had to try it because I'm a big calamari fan. 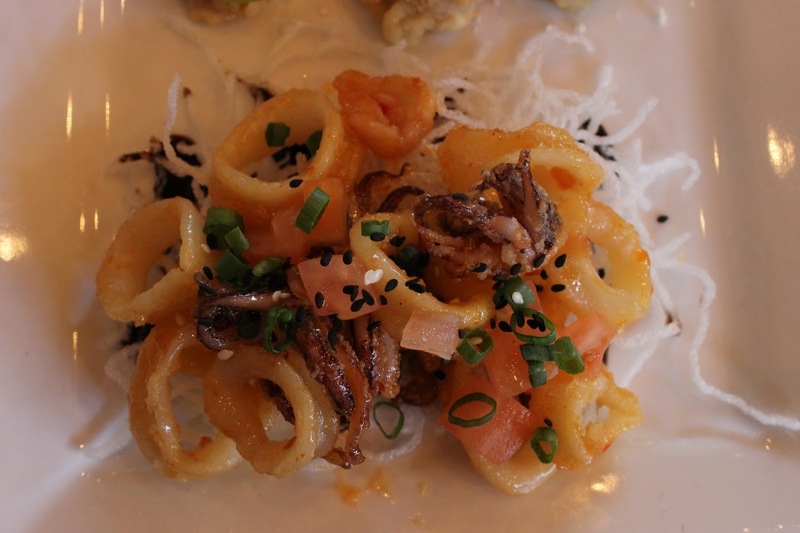 Creo's calamari is definitely different from your traditional fried calamari with marinara sauce, but I absolutely loved it. 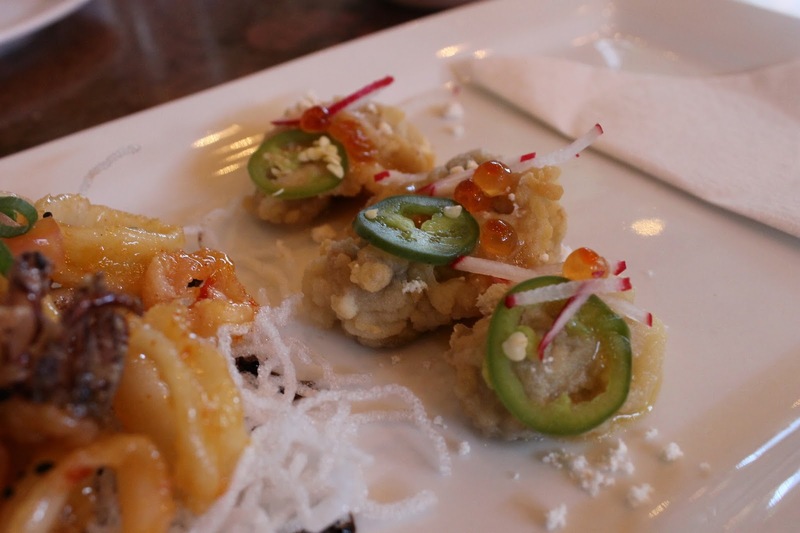 The sweetness from the Thai sweet chili glaze was a nice alteration as were the bits of scallions and sesame seeds. 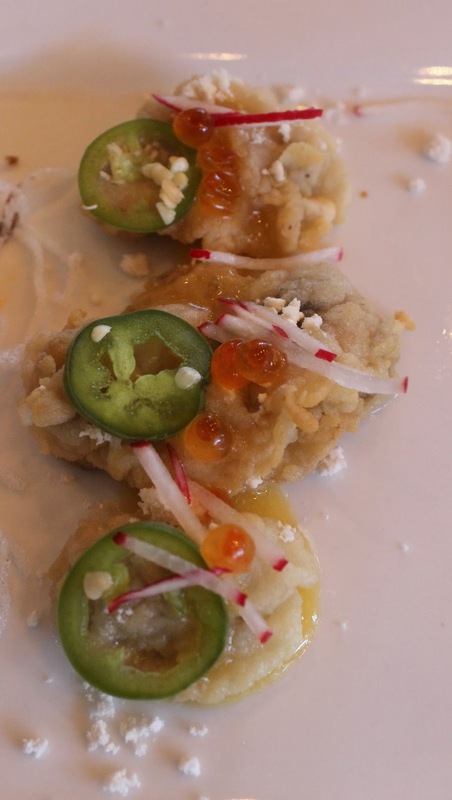 Fried Oysters with orange sauce, radish, pickled chili, fish roe, and sesame powder. These little guys were a thing of beauty. I'm always down for oysters, so when I saw this on the menu I instantly knew I'd have to try them. As expected, they were delicious. However, I had the "save the best for last" mentality and should have just tried them first, as they weren't as crispy after sitting on the orange sauce for a couple minutes. Nevertheless, order them! 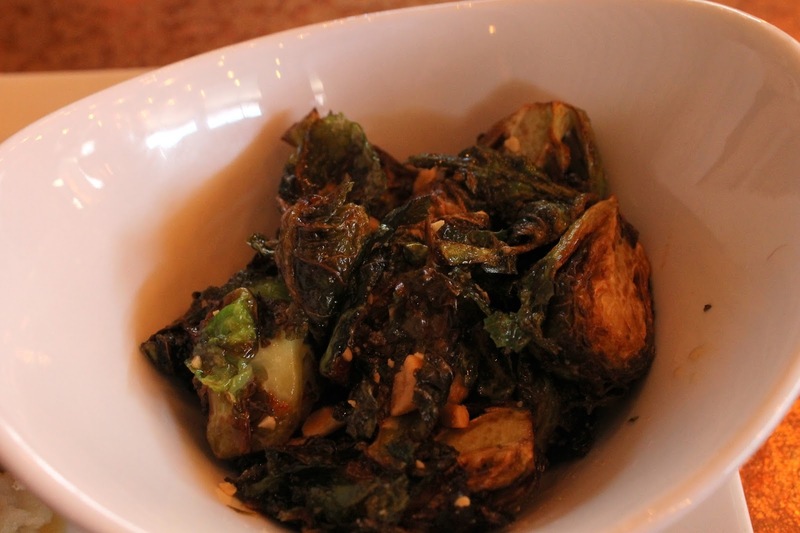 This version of brussels sprouts are my new favorite flavor combination. 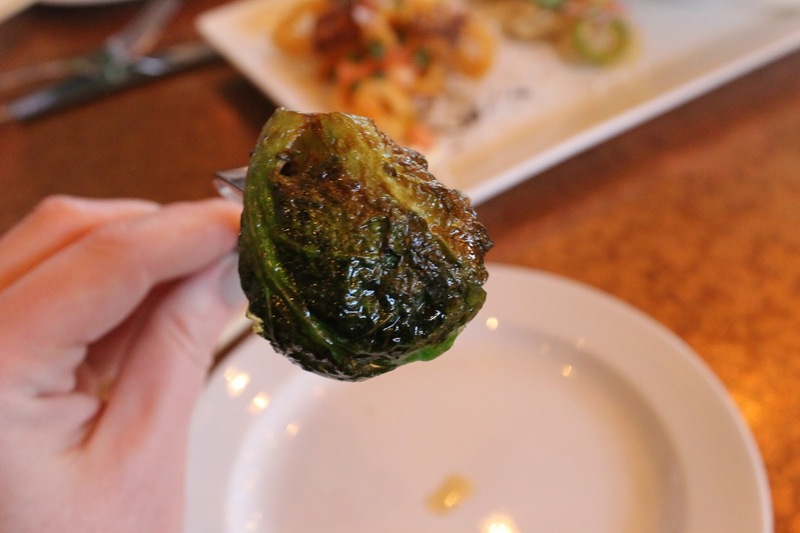 Chef Sell did a wonderful job crisping up the outsides of the sprouts, while still leaving the center a tiny bit crunchy. 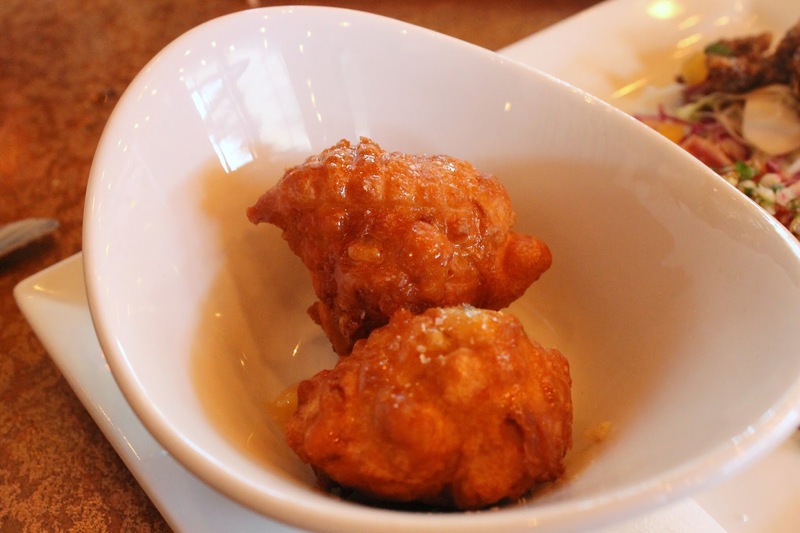 Jalapeno corn fritters with clover honey and sea salt. 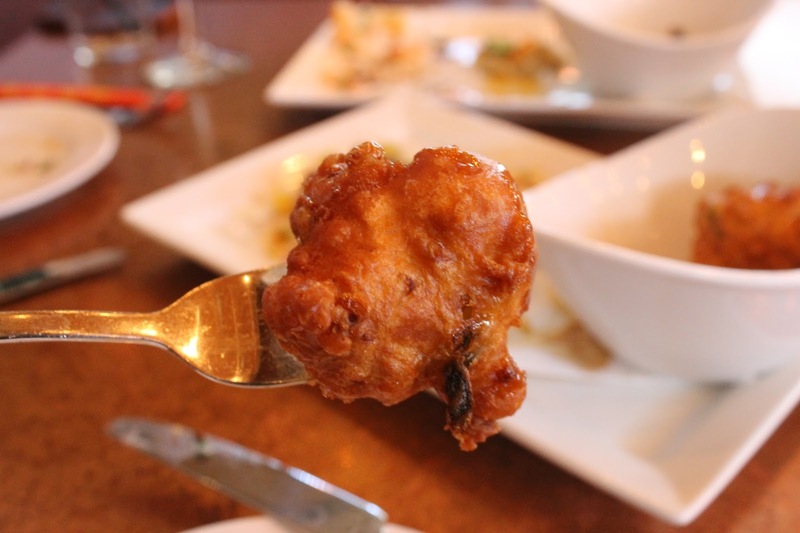 These fritters are the perfect combination of sweet and spicy. There was a strong jalapeño presence in the fritter, which I liked, and was only slightly toned down when you combined a bit of the clover honey. 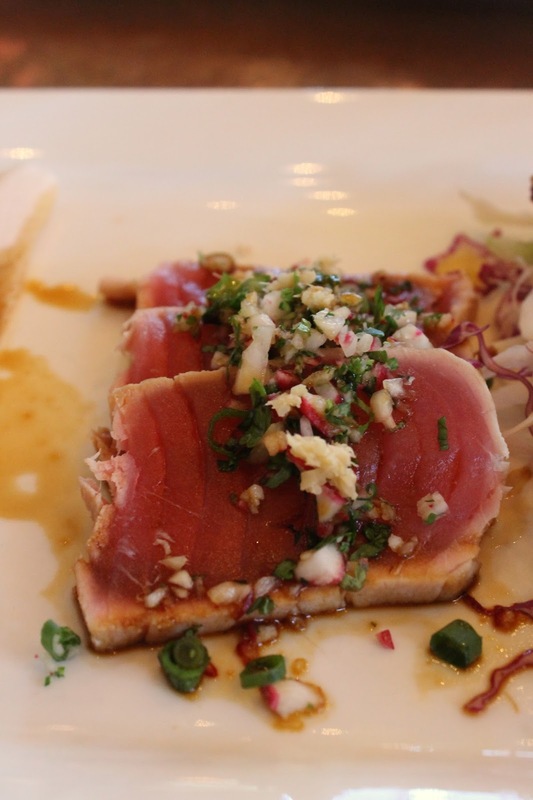 Tuna Tataki is sliced seared ahi tuna, with green herbs, radish, minced ginger, lemon, mirin, and sweet soy. This appetizer definitely wont disappoint, the tuna is top notch and it just screams summer with the green herbs and ginger. 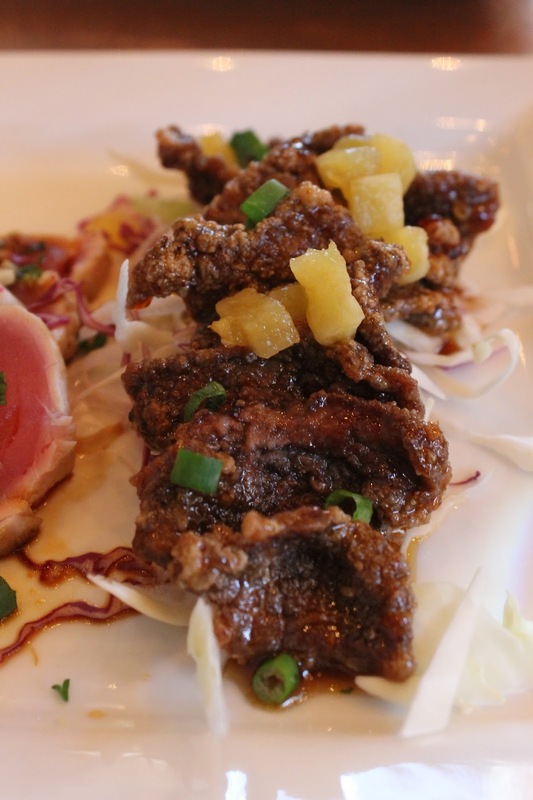 Sambal Beef was crispy spicy beef, carmelized pineapple, and sesame seeds. 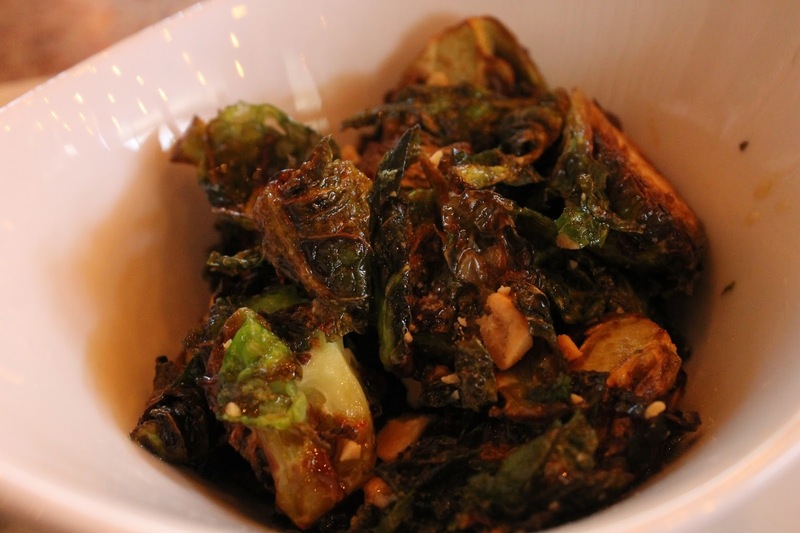 This dish had great texture and flavor! 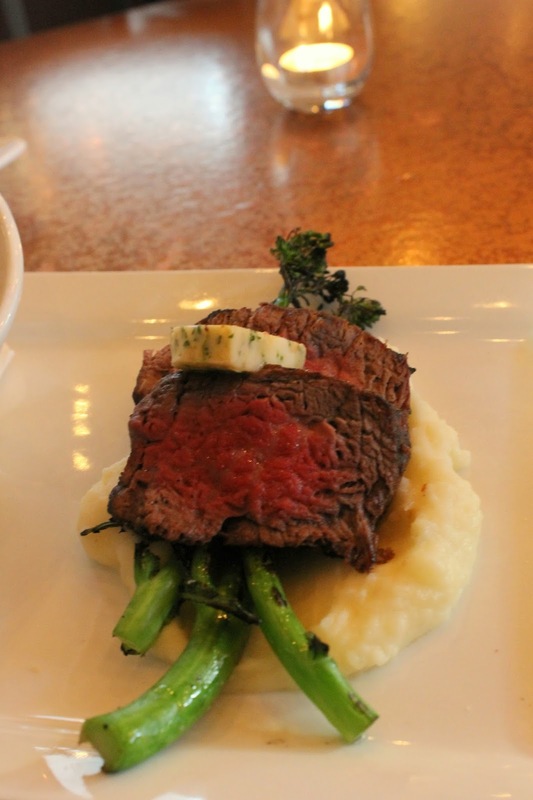 We chose four different entree options, starting with the filet mignon with mashed potatoes, broccoli rabe, and compound butter. 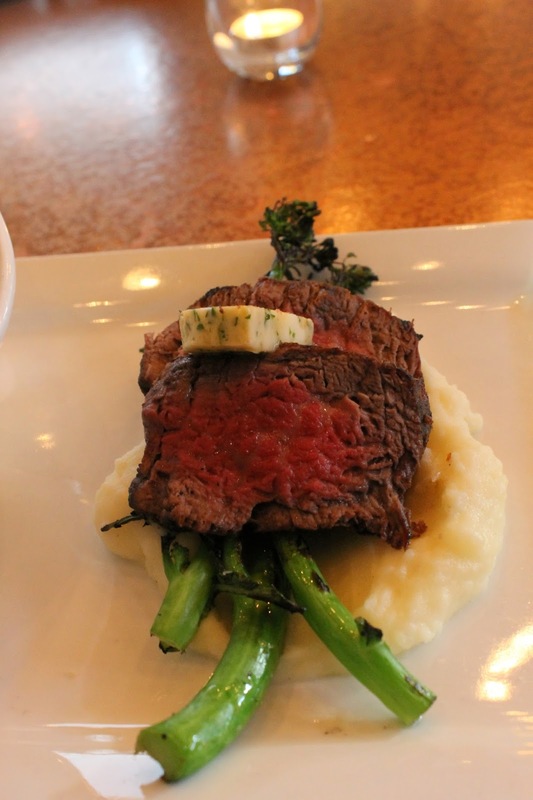 The filet was prepared perfectly and was extremely tender with a flavorful crust on the outside. 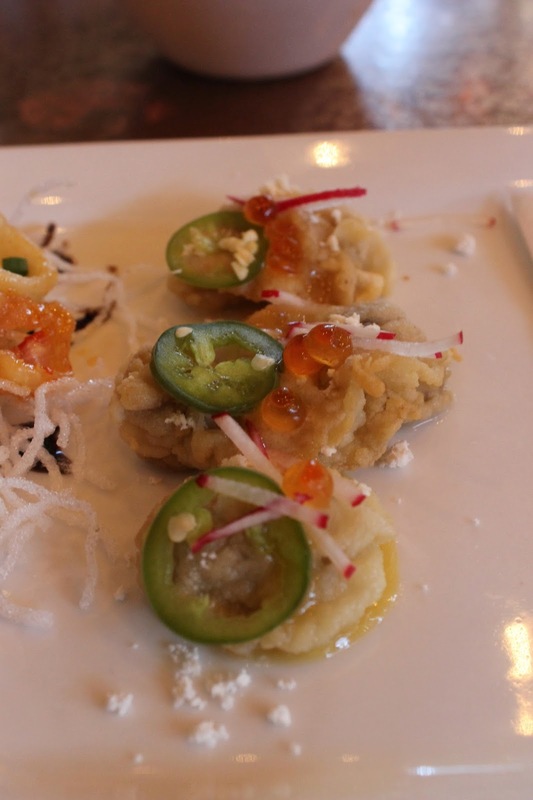 This dish isn't a new menu item, but like the oysters it was something I had to try as soon as I saw it listed. 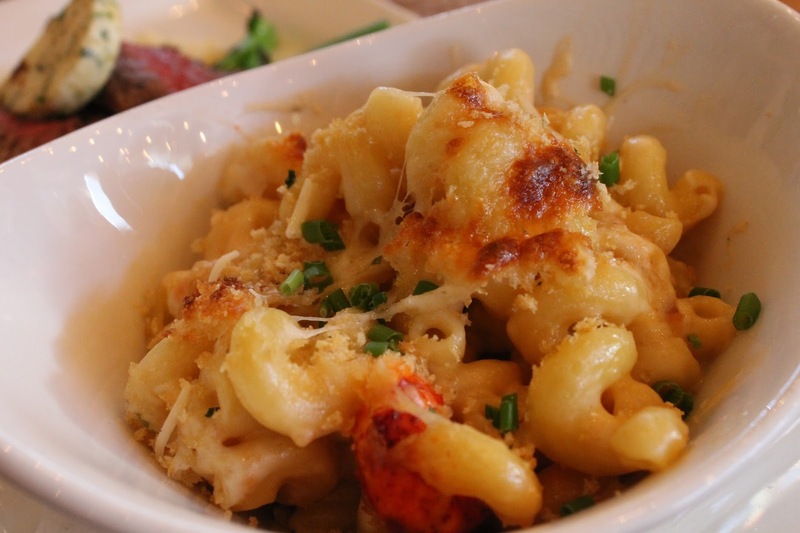 The pasta was al dente and it was cheesy perfection, but I definitely would have enjoyed more lobster scattered throughout. 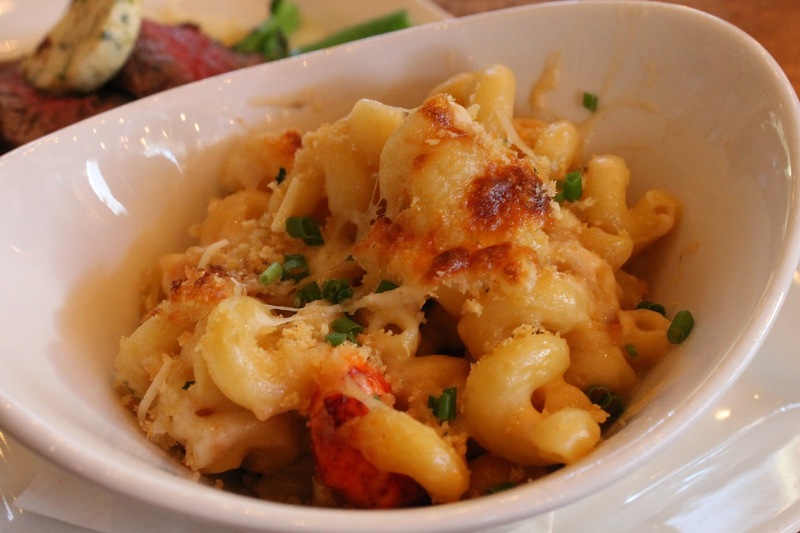 Always, more lobster. 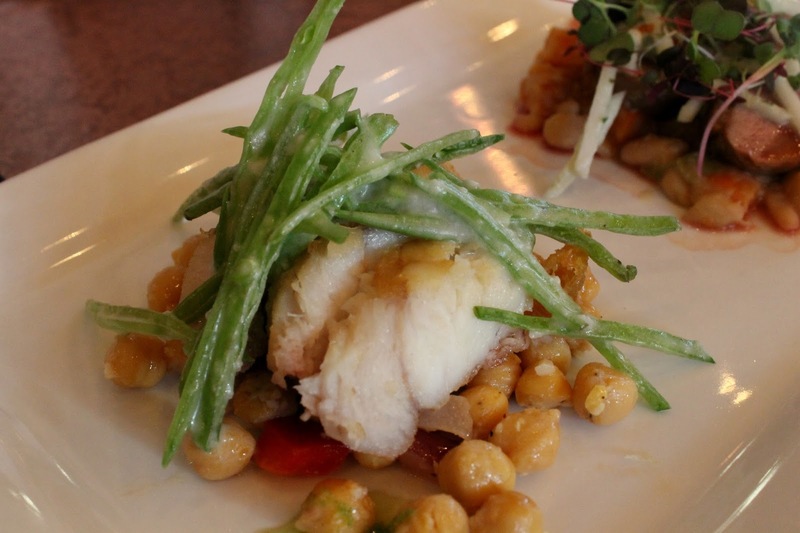 Monkfish with snow peas, cantaloupe puree, ginger chickpea salad, red peppers, and scallion oil. 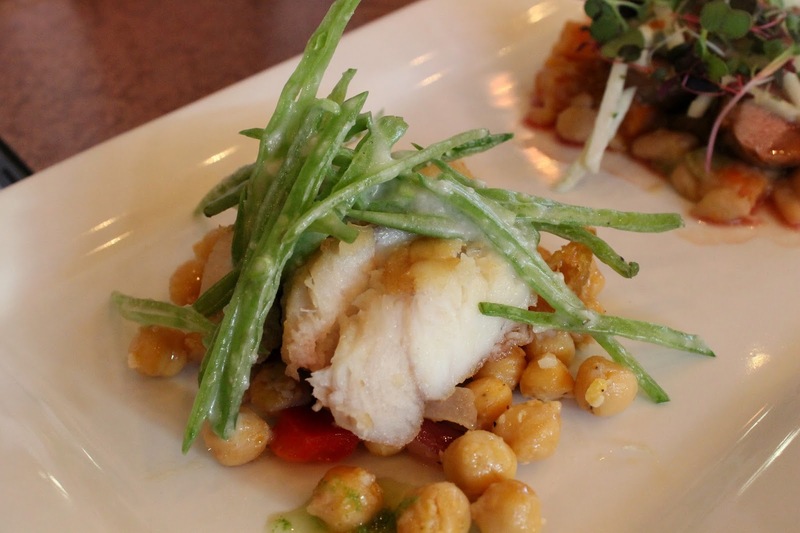 I was torn between the Monkfish and the Arctic Char, but at the last minute I decided on the Monkfish. 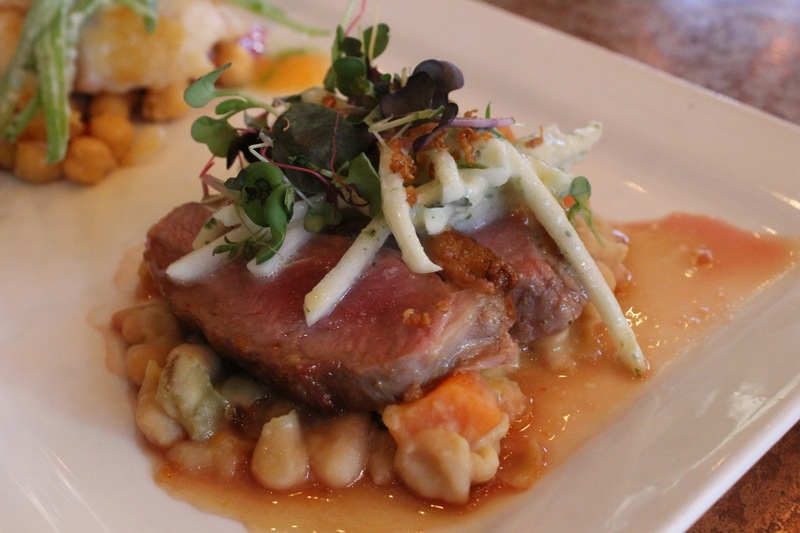 I was happy with my choice and really enjoyed the cantaloup puree and the fresh crunch from the snow peas. 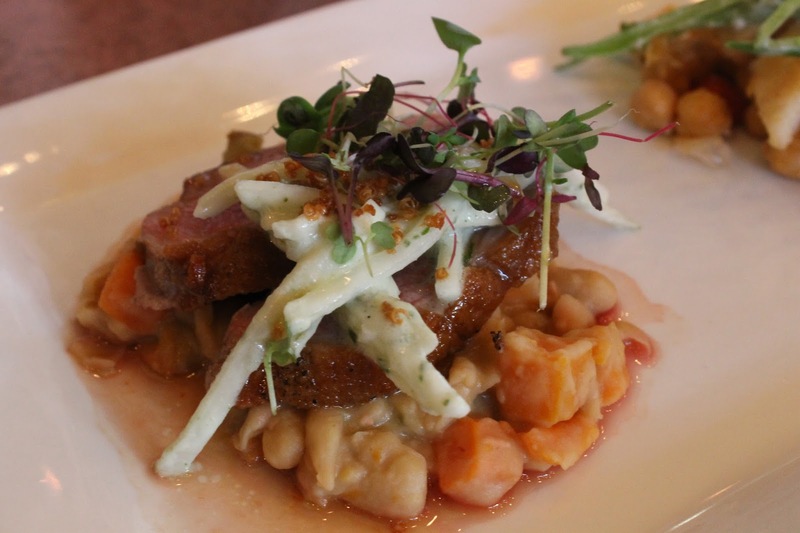 Duck breast with cold turnip salad, coconut basil vinaigrette, white bean ragu, and a maple miso glaze. 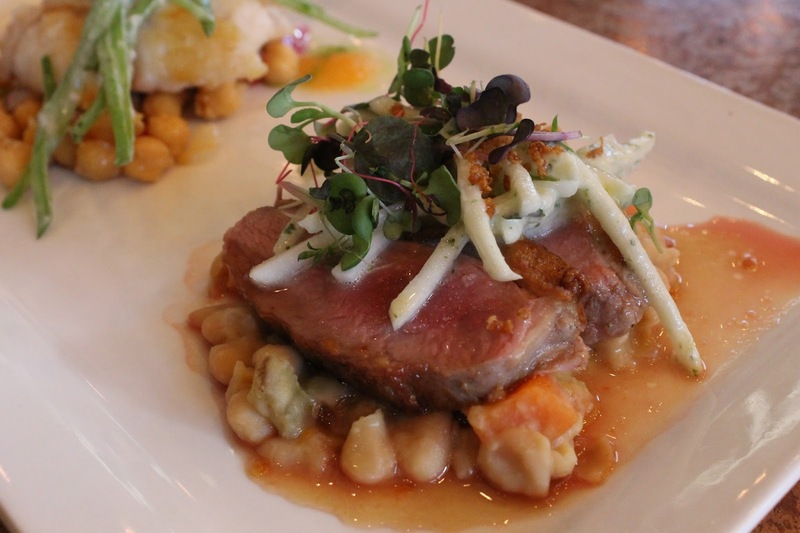 Beautiful presentation, wonderful flavors, and cooked to perfection. 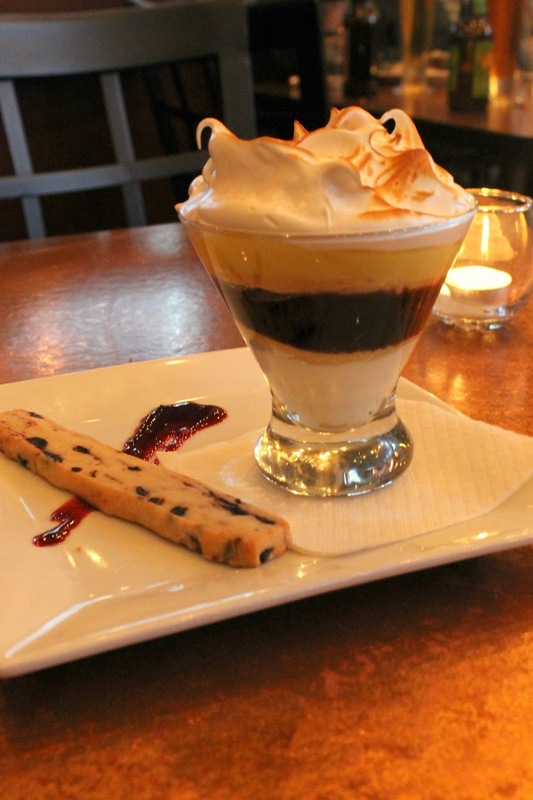 Creo' recently hired a new pastry chef, and knowing that I like lemon desserts, they brought out this beautiful blueberry lemon meringue creation. Before the evening ended I was able to sit down with Chef Sell. I asked him which new addition to the menu was his favorite and he told me he really enjoyed the Slow Roasted Pork. They roast the pork in house for quite a long time while seasoning it with a Japanese togarashi rub. The pork is served with kale, broccoli, dashi broth, herb salad, and brown rice. 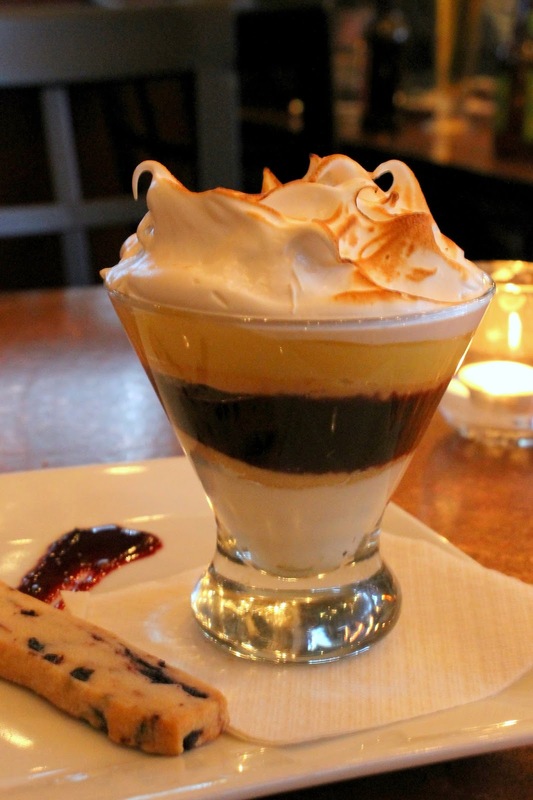 I wish I ordered that, but I guess I'll just have to save it for my next visit! Head on over to Facebook to give Creo' a like, so you can stay up to date with everything they have going on. 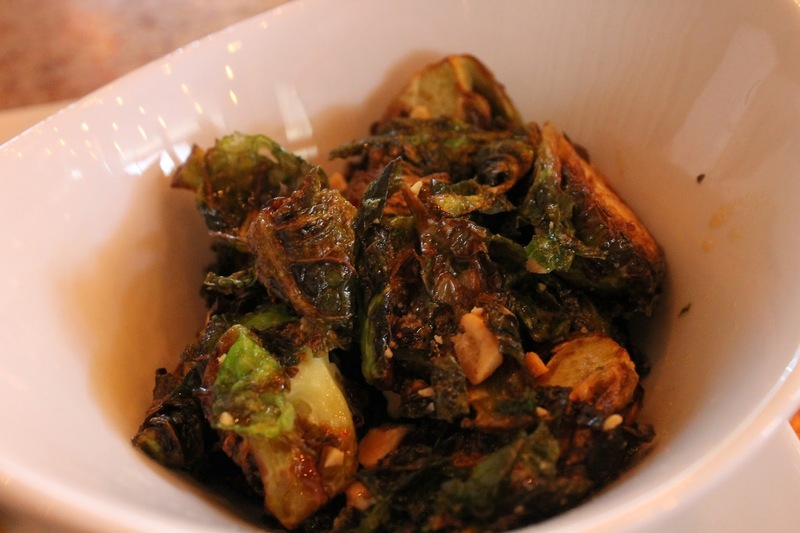 Which menu items do you think you'd like to try most? Couldn't have said it better myself, yummmm!!! My group of friends enjoys eating and trying lesser known beers, or the amazing cocktails with best boozy brunch nyc. This is the best place I know with the most perfect environment. It has become my favorite venue over the last year.